The History of Litchfield County, published in 1881 by the J.W. Lewis Company in Philadelphia, suggests that North Goshen was once a thriving community. The book offers a house-by-house guide, describing the area’s residents as well as their commercial and religious activities. Nearly all vestiges of the community are now gone and the land is owned by the Torrington Water Company. A few remaining clues, however, hint at the area’s past. Along East Street North, for example, stands a rebuilt enclosure once used to impound stray animals. 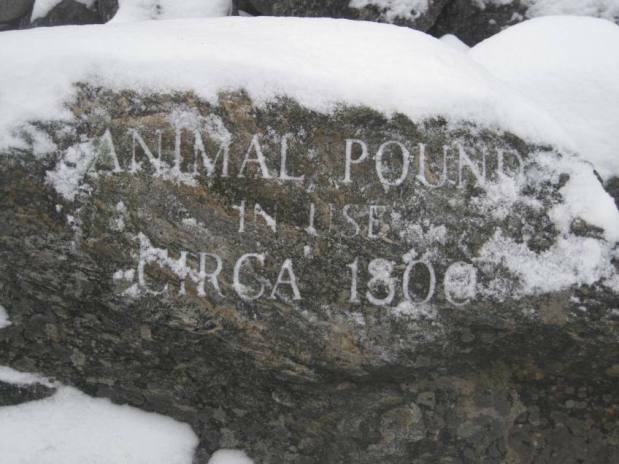 A stone marker describes it as still being in operation around the year 1800. Early European settlers in North America typically allowed hogs, cattle, and other livestock to roam freely. This tactic permitted animals to find free forage, but it also had drawbacks that growing communities sought to control through laws and other means. At meetings called in 1739 to establish the town of Goshen, residents appointed three horse branders whose task was to apply a distinctive mark to each resident’s animals. The measure sought to prevent disputes over ownership. That year, 66 distinct marks were recorded in Goshen. At that same meetings, those assembled gave two men permission to build town pounds. Livestock, by town ordinance, could roam free from March to November. However, animals not in their owners’ barns by November would be impounded and cared for by the town’s pound keeper. Owners arriving at the pound hoping to claim their animals first had to pay a fee to the keeper. Town records in Goshen also indicate that those delinquent in paying their taxes could work off their debt by supervising the town pounds. In 1989, as part of Goshen’s 250th anniversary, the Torrington Water Company restored the remains of one such pound. Its walls are 35 feet long, 25 feet wide, and stand 4 feet high. 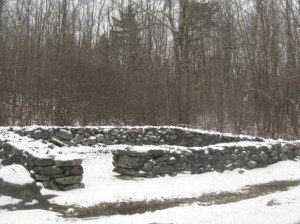 Agrarian structures like the animal pound remind us that livestock were once a central feature and concern of daily life for Litchfield County residents. 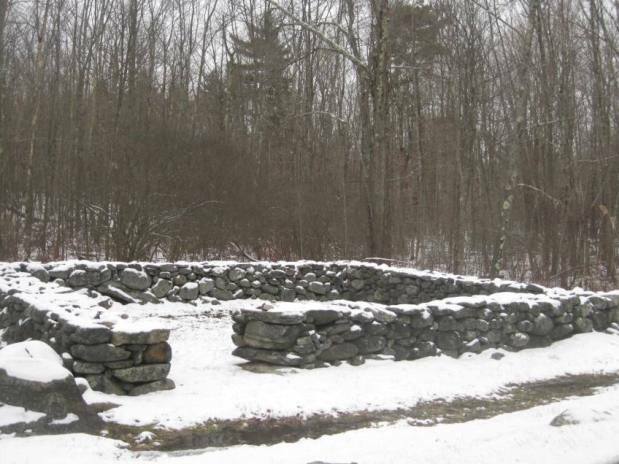 Peter Vermilyea, who teaches history at Housatonic Valley Regional High School in Falls Village, Connecticut, and at Western Connecticut State University, maintains the Hidden in Plain Sight blog and is the author of Hidden History of Litchfield County (History Press, 2014).